This was an exciting and busy month for me with the prospect of a my new lathe being delivered. I also attended the bi-annual AWGB Seminar at Loughborough University. This was the third time I had attended, only this time I chose to stay on campus which allowed me to enjoy the more social side of the event. With Loughborough being only about 20 miles from home, I had previously driven home each evening but Vanessa suggested that I should stay this year, so I did. I had a very enjoyable weekend eating, drinking, catching up with friends and making more, and of course, watching lots of turning! Within a week of the seminar my club, Tudor Rose Woodturners, arranged a demo by Richard Raffan which was a must-see event. We were treated to a slide show and presentation on the Friday evening and a full day of him turning on the Saturday. Then of course there was the work I did which included two turning demos of my own, my usual range of walking canes, a set of oak (Quercus robur) bun feet, some stair spindles, a trophy base, an oak stool and finally, a roof finial. 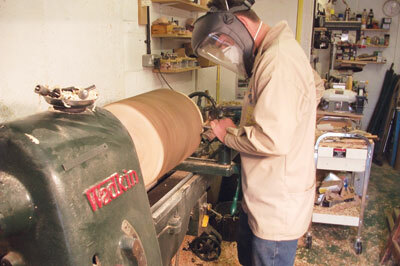 As soon as I had seen the Wadkin lathe, I put the wheels into motion to try and sell my Jet lathe. I posted a general enquiry on the Woodworkers Institute Forum as to whether anyone might be interested, as well as making an announcement at my club. Initially, there wasn't much interest - which was worrying - my workshop is not that big so there is only room for one lathe. A few days later, I had a guy come to the workshop for a lesson; Ray knew of me through the forum and, having seen my post, expressed an interest in the Jet. I suggested that we do the lesson and see if he was still interested at the end. He was so impressed that he said he'd have it. 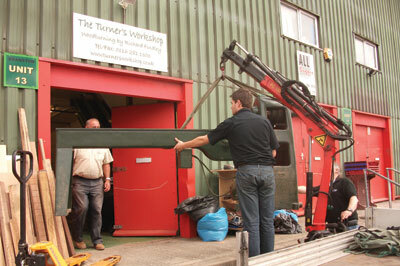 The only problem being that he couldn't take it straight away as his workshop wasn't entirely ready for it, plus there was another week before the Wadkin would arrive. We agreed that he would come for another lesson in a few weeks' time and I would try and store the Jet at my parents' house until then. With the lathe in and running, cleaned down and lubricated, it was time to get some work done. 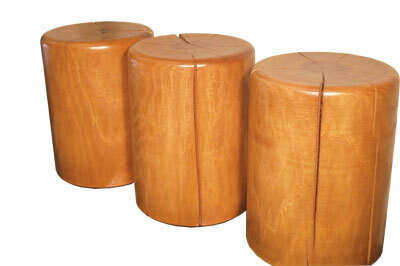 The week before the Wadkin had arrived I had been given a commission to turn some rustic log stools. The turning itself was pretty straightforward; I was to mount ash (Fraxinus excelsior) logs between centres - around 300mm (12in) diameter by 450mm (18in) long - and turn them round, with a radius on the top corner, dished at the top to sit on and a chamfer on the bottom corner. The problem was that when the logs were delivered, I had mounted the smallest log on the Jet to give it a go but the vibration, even at the slowest speed, was too much as to be unsafe. On the Wadkin, however, it was a completely different story. I mounted a log and started at the lowest speed - 200rpm - then 320, at 500rpm there was the smallest hint of a wobble so I trued them up and went up a bit faster for the main turning. Four log stools turned and the Wadkin had proved itself already. The stools were stained and lacquered and allowed to move and split as they dried out properly. The customer was very pleased with the outcome. The next test was a production run of 160 acorn finials in American tulip (Liriodendron tulipifera) for a display job for a clothing retailer. 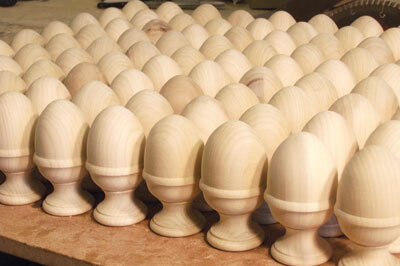 These really helped me familiarise myself with the new lathe. It also got the lathe running properly again; after five years of very little work it needed using. Machines like this thrive on being worked and these first two jobs certainly did that. Like any big purchase, there are some extras that needed buying for the lathe that I hadn't necessarily entirely accounted for. There was the initial wiring in, then I had a new chuck to buy for it, but being an old machine, it has a slightly odd 1 3/8in x 6tpi spindle thread; no chucks are produced with this so I had an Axminster Super Precision Chuck sent to me with a blank backplate, and I had a local engineering firm cut the thread into it. 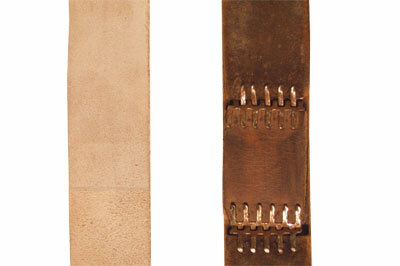 Then there was the belt. I was aware that the Wadkin was going to be a little noisier than the Jet because of its design. On closer inspection, the main culprit for this noise was the original leather belt, or more precisely the large metal joiner that rattled around the lathe pulleys. I contacted my local bearings and belts supplier and arranged for a new belt to be fitted. Made from chrome leather with a nylon core and bonded on-site, it is effectively a continuous belt and runs so much more quietly. I was also able to re-tension it to give maximum drive to the spindle from the 1 1/2hp, three-phase motor. 2. Another good tip for finding the best height for you is to turn your back to the machine and stand comfortably, holding a tool as if turning, then turn back to your lathe and compare this position with your actual working height. You may be surprised! My initial concerns were unfounded and after a month of use, I feel comfortable and very pleased with the Wadkin. It was built to last and should serve me well for many years to come. 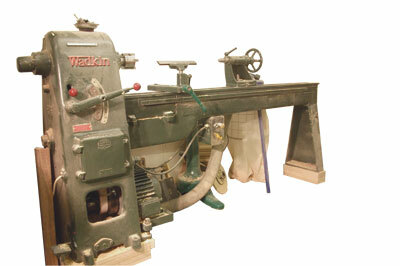 To find out more about the Wadkin RS lathe take a look at my website.